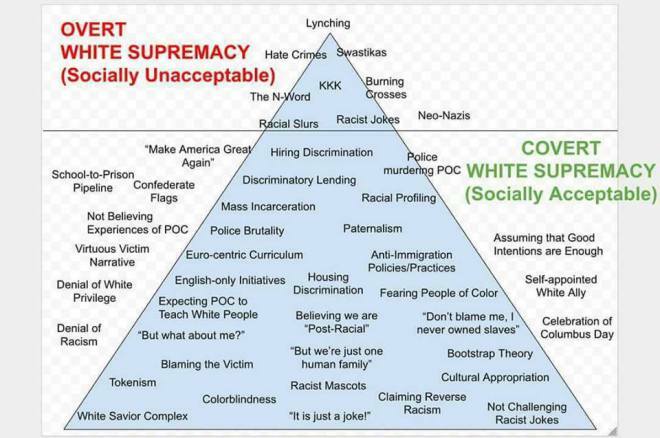 Most people who actually know about racism recognise the part under the little triangle. Lots of fans live almost exclusively in the triangle. When people more well-versed in the ways of racism in society – and people of colour especially – talk about racism, what they’re likely referring to is systemic racism. It is practiced in social institutions and political ones, by individuals and social groups governed by social norms that support racist thinking (microaggressions and stereotypes). We can see this in differences in wealth, access to housing and education, employment opportunities, and more. It is when one or more groups are targeted because of their race and subjugated in the social hierarchy. And the most important thing to note about systemic racism is that it is never only perpetuated by people we would obviously call racist. The United States was, quite literally, founded as a racist society. It has been racist since 1492 when Christopher Columbus, in an act of privileged caucasity that has subsequently been matched by neither his kinfolk nor his skinfolk, sailed the ocean blue, “discovered” America, and ushered in the systematic subjugation and genocide of African-Americans based on the belief that white people were superior to Black people, due to his “discovery” ushering in the slave trade. This is where systemic racism against Black people in America comes from. Systematically brutalised for hundreds of years, they were eventually “freed” only to find the government and society set up against them. Despite quite literally building the United States, African-Americans were not regarded as citizens in the same way their white counterparts were. There’s all the stuff we learn about – sitting at the back of the bus, not being allowed to drink from the same water fountains or go to the same schools, and being forced to work in menial jobs because of the lack of opportunity for education and upward mobility. Then there’s forcing Native Americans off their land. Japanese internment camps. Discrimination against the Chinese for stealing the white man’s jobs. Discrimination against Mexican Americans that ended in many being removed in forced repatriation. But it’s also things like the New Deal, and the stereotypes faced by all groups. You will see this in the dearth of Black people in positions of power compared to white people (#OscarsSoWhite, anyone? ), the sheer whiteness of the government, and the lack of funding for schools with a higher population of students who are of colour, for example. There’s also the social norms that make racism “acceptable,” like racist jokes, assuming that all people of Asian descent are extremely intelligent or that Black people like watermelon, wanting to date a person of colour because your babies would be mixed and beautiful – anything that dehumanises and marginalises people of colour is a microaggression that shows you don’t really see them as full people. This is caused and exacerbated by the systemic racism that places Black people at the bottom of the social hierarchy and is supported by social norms that keep them there; norms pervasive enough to influence the way we react to characters. These microaggressions and stereotypes result in dehumanisation and marginalisation of said characters, culminating in many fans subjecting Iris to misogynoir, the anti-Black racism that is reserved for Black women. This is evident in the standards to which they hold Iris as opposed to men or white women. Her contributions and value are often ignored, violence is constantly wished upon her character for trivial matters, and her position in the narrative is consistently questioned. Of course, nobody’s going to explain that to Snowbarry shippers on the internet. Very few people have the time or the patience and, until a couple of months ago, we all only had 140 characters. And the thing is that most people who care don’t need this explanation, because they’re socially conscious enough to know where the racism aspect comes in. There are Black women, non-Black women of colour, and white women alike (men too, but it’s mostly women who ship on a large scale) who recognise the behavioural patterns behind the subtle racism of shipping. So when a person in The Flash fandom says that Snowbarry shippers are racist, people who recognise the signs know that Snowbarry shippers are probably massive perpetrators of misogynoir while hiding behind flimsy excuses to justify their hatred.